I've been working out like crazy lately which has me sweating profusely from every pore in my body. It feels amazing to have all that energy again and to see the progress but my hair isn't a fan of this at all. I don't have the type of hair that I should wash every day and I don't have the magic hands that Dominican hair stylists have so I've been taking care of it myself once a week-washing, rollers, blow dry, straightener. But, now that I'm working out so much I feel like it needs to be washed at least twice a week so that it doesn't smell like sweat. Double eek! Add to that, I love dying my hair a medium brown color because I think it goes better with my skin tone than my super dark brown, so needless to say I've got a lot of issues with damage going on. Serums, sprays and leave-in conditioners have become my best friend but I like to change things up every once in a while. That's why I was happy to give Pureology's Colour Fanatic Leave-In Treatment a try. I received a small bottle to use so I was eager to give it a spin the next time I washed my hair. After washing with my normal shampoo and conditioner I used this leave in conditioner and let my hair air dry. That's how I like to test out new products that claim to leave my hair super soft and silky. Since it's so warm out my hair dried pretty quick and thanks to this product it was super soft and smelled like heaven. My curls were soft, not tangled and I knew that if I wanted to use the straightener after my hair would be silky, and it was. 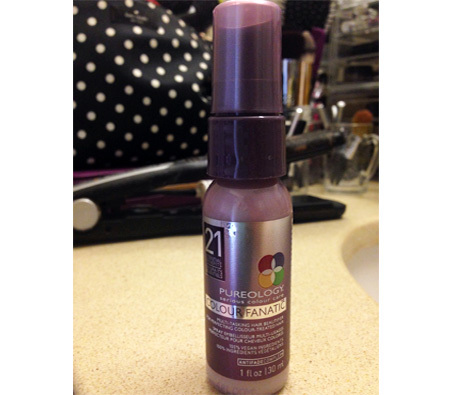 Overall it's a good product and the cost isn't steep. My hair looked shiny, my split ends weren't as noticeable and my hair had a put of volume when I put it up in a high ponytail. So if you want to get your hands on one of these the company giving one away so leave a comment as to why you want one and you could be lucky one!